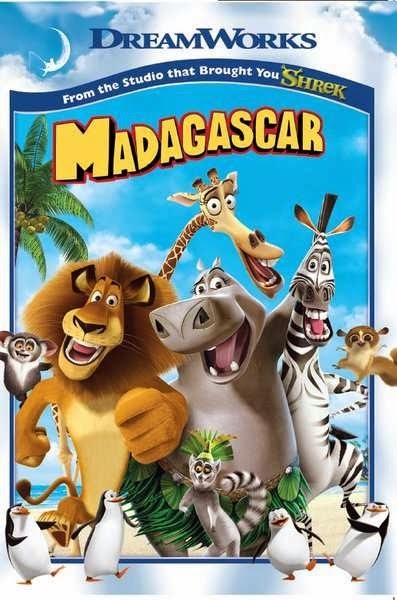 "Madagascar" (2005), directed by Eric Darnell and Tom McGrath, is a terrific film for kids of all ages. The presentation is bright, funny, happy, and quick-paced, with all sorts of quirky scenes to keep the story from getting too predictable. 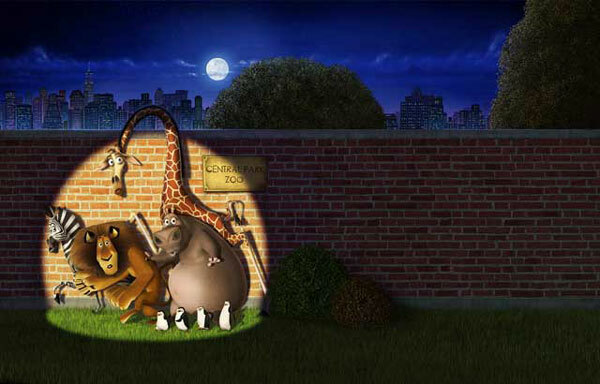 The plot is easy for children to follow while being clever enough to satisfy most adults. 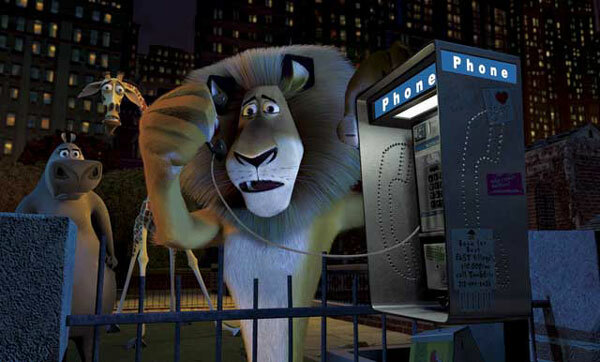 The lead voices are provided by some of the top comics in Hollywood, and DreamWorks Animation delivers the goods as usual with its top-grade animation. Several animals live together in New York's Central Park Zoo: They have become good friends and are the stars among all the animals, but some of them are getting a little bored. 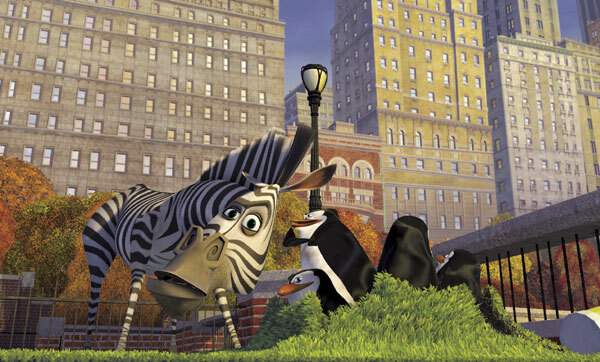 One day, Marty the Zebra (Chris Rock) leaves the zoo to do a little exploring in the city around them. Marty's friends quickly take off after him to bring him back. 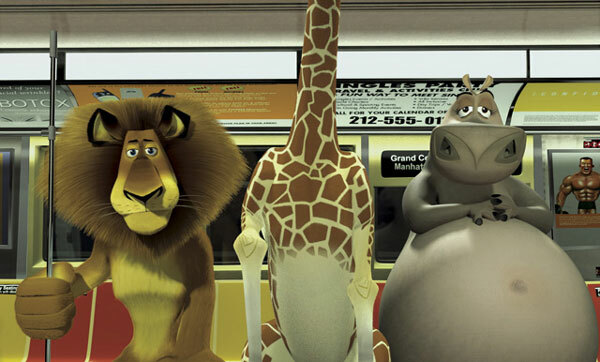 They all wind up Grand Central Terminal, but Alex the lion (Ben Stiller) gets them all sedated when his attempts at communication with the people around them are mistaken for aggression. 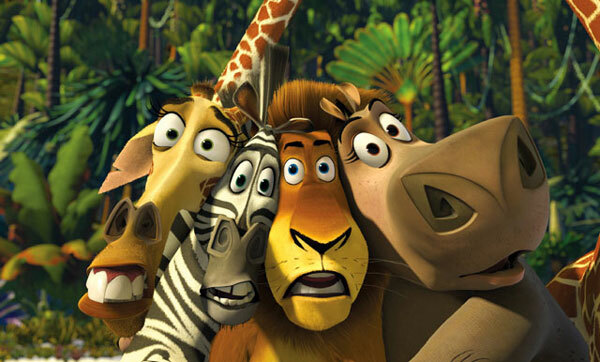 The zoo decides to ship them off to Africa, where they can live on a nature preserve. The penguins that are traveling with them, though, break free and take over the ship because they want to go to Antarctica instead. 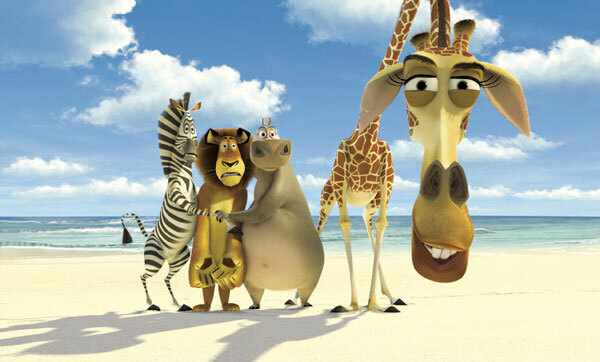 During the confusion, the crates containing Alex, Marty, Melmen the giraffe (David Schwimmer) and Gloria the hippo (Jada Pinkett Smith) fall off the ship and wash ashore on ... Madagascar. 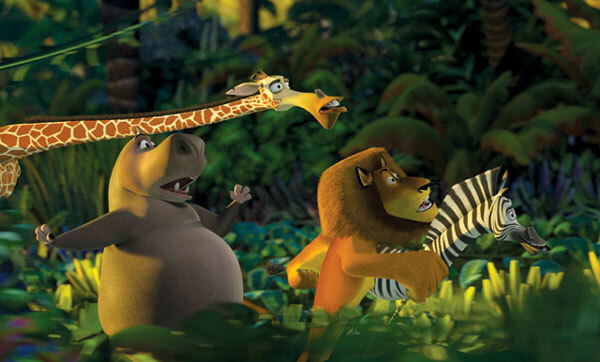 The four friends gradually acclimate to their new jungle surroundings, helped by King Julien XIII, the King of the Lemurs (Sacha Baron Cohen). Alex, though, succumbs to his predatory instincts and attacks Marty, which causes the others to banish him to the other side of the island. The penguins then return on the ship, having tired of all the snow in Antarctica. Realizing this is their chance to return to New York, Marty joins up with Alex. Alex then manages to control his instincts and helps rescue the penguins from an attack by fossa, and everybody lives in harmony again. 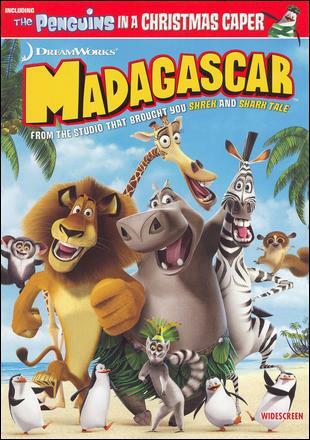 There are many humorous scenes in "Madagascar," such as the reaction of the penguins to their dream-world of Antarctica and the pride some of the chimps have about themselves. It is not laugh-out-loud funny, but there are decent laughs. A highlight is Cohen singing "Move It," which many kids will probably sing along to as well. One complaint often heard is that so much time is spent meeting the characters and following them to their destination that not much happens in the story. Since there are two sequels already out and a third on the way in 2015, that is not as much of a problem as when the first film was released. Now, you can own all three and really get to know the characters without being rushed through one adventure after another. This is highly recommended for younger viewers, who may not get the references to classic science fiction films like "Planet of the Apes," but should enjoy the funny actors voicing the main characters.